After starting this new challenge one month ago, things are like puzzle pieces coming in and fitting pretty well. Riding on the success of the 5-years old Good Image Tea, our researcher in Malaysia had just formulated few new products. These were the result of our regular customers’ feedback but in the past, the focus was to do contract manufacturing only as there was also no other sales and marketing resource. Next, for the past 15 years, exhibition organizer, Eastern Directories in Singapore “rocks” the whole of Singapore during the March and September school holidays. They had also sent ripples across the neighbouring countries and attracted tourists alike. – the IT Show and Comex Show. For the past few years, they have created another huge carnival, the Food & Beverage Fair, just one week after their IT event. I was there on their first fair and the “hungry” human army walloping the thousands of different food & beverages reminded me of the massive human movement all across China every Chinese New Year, May Day and their National Day. Looking at the organizer’s website http://www.foodandbeveragefair.com.sg showing last year pictures, the traffic had risen to over 628,000 visitors during the 5 days event. Sure, I would want to participate to test out the event’s effectiveness for Good Image Tea as well as use the event to showcase the new Good Image Tea to the 700,000 expected visitors. The good booths were snapped out right after last event as most of them were the large and regular vendors. BioLife Marketing got a 4 x 3 meters booth and we shall be there next week for 5 solid days, 11am-10pm from 14th -18th March at the Suntec City Exhibition Center. Meanwhile, go visit Singapore’s Largest IT, Digital and Consumer Electronic Exhibition from this coming Thursday to Sunday, 12.00-09.00 pm. 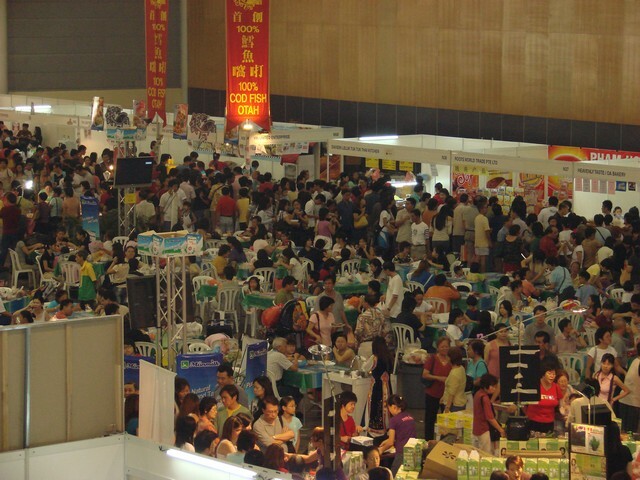 http://www.itshow.com.sg This week IT Show 2007 (8th -11th) is 300,000 sq ft or 5 football fields (11% bigger than last year) and is expected to draw some 700,000 visitors with a top lucky draw prize of S$20,000 for every S$100 spent from the choice of over 780 manufacturers and suppliers.